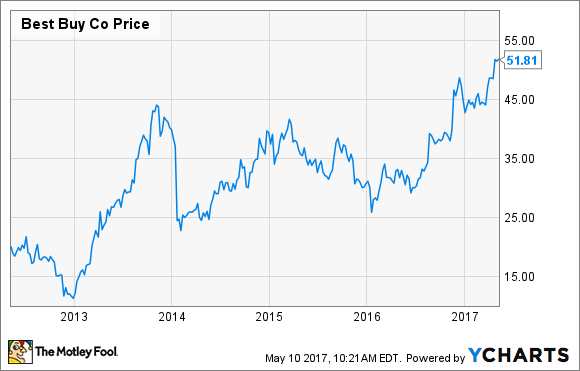 Where Will Best Buy Stock Be 1 Year From Now? The company has come back from being nearly dead, but the next steps are going to be challenging. Best Buy (NYSE:BBY) CEO Hubert Joly does not get the credit he deserves for taking on a company that easily could have followed former rival Circuit City onto the list of retailers that no longer exist. When he took over as chief executive in 2012, Joly inherited a company that would lose $3.36 per share for that full year. At the time, the company was reeling as it struggled to compete with Amazon.com (NASDAQ:AMZN). Best Buy was being hurt by showrooming, the practice of customers visiting a store, taking advantage of its resources, then buying the item online (probaby at a better price). Many analysts and investors assumed Best Buy's fate was inevitable, and naming Joly, who came from the hotel and restaurant industry, as CEO did nothing to assuage those doubts. However, only a few years later, Joly had turned the company around, causing some analysts to have to admit their mistake. Best Buy was an improbable turnaround, but it still faces a difficult road. The company may be on more sure ground, but it still operates in a retail market that's facing very strong negative headwinds. Best Buy has focused on customer service. Image source: Best Buy. Where is Best Buy now? In five years, Best Buy has come a long way. In its completed fiscal year 2017 the company reported diluted ESP of $3.74, up from $2.30 the previous year. Joly made that happen by transforming his company in big and little ways. He led a major initiative called Renew Blue that focused on cutting expenses, improving customer service, and improving how consumers perceive its prices (which included matching Amazon's prices on identical items). It's fair to say that while work remains to be done, Best Buy has put itself on stable ground. Joly declared as much during the Q4 earnings call, which was transcribed by Seeking Alpha (registration required), saying, "We figured it is time to call Renew Blue officially over and enter the next phase of our journey." Where is Best Buy going? As you can see above, over the past five years, Best Buy stock has had its ups downs, but it's in much better position than it was when Joly took over. The dips are largely tied to earnings reports when sales came in below expectations, which investors seem to value over earnings improvement due to increasing operating efficiencies. Joly, however, has set his company up for its next steps and whether you should buy its stock depends largely on whether you agree with his vision for what comes after Renew Blue. He laid out that vision, called Best Buy 2020 during the Feb. 26 Q4 earnings call. In this next phase, we go from turning around the company to shaping our future, and creating a company that customers and employees love, and that continues to generate a superior return for our shareholders. At the core of Best Buy 2020 is of course the customer. Technology is evolving and is more and more exciting, with new capabilities that are opening up an increasing range of possibilities. It's also more complex, and many of us need help with it. So we believe we're uniquely positioned to help our customers in a meaningful way with our combination of unique assets, including our online, store, and in-home capabilities. Growing online sales will be a significant part of Best Buy 2020 and the company has been making steady progress in that area. E-commerce revenue increased 17.5% in Q4, and was 18.6% of total domestic revenue, compared to 15.6% in the fourth quarter of last year. Joly expects that number to continue to grow and for the company to increasingly use its stores for online order pickup and returns. Where will Best Buy stock be in one year? Best Buy shares closed April 2013 at $25.99 and were actually down slightly to $25.93 at the end of April 2014. In 2015, however, the stock began advancing and climbed to $34.65 at the end of April 2015, then dipped slightly to $32.08 at the end of the same month in 2016. By April of this year the stock truly took off as it closed the month at $51.81, nearly double where it stood in April 2013. Essentially, Best Buy has been rewarded by investors for getting past its turnaround stage. Joly's leadership clearly suggests that ultimately the company will grow and raise its stock price, but that may not happen in year one of a three-year plan. The electronics chain will likely have a successful year, but market conditions suggest that the company's forecast of flat fiscal year 2018 growth is a reasonable target. If that happens, shares will likely trade a little up or a little down, but not materially different from where they are now. Best Buy is a long-term success story that Joly is not building to pop quarterly results, but to create enduring success. He will get there, but to put things in sports terms, this looks like a rebuilding year.